Why did you post this on N4G? Nothing is spectacular about these prices and you are just lying cuz I found Tenkaichi 3 for 25 euros NEW on ebay just by a quick look on Ebay. I found metroid prime trilogy 10€ in a bargain bin..
@anonymous - Prices in Europe vs prices in the USA can be very different. This list is based upon prices for the NTSC versions of the games. @anonymous - Thanks for the heads up on Fritz Chess. Can't believe I missed that one in the initial write-up. I will edit the article right now with that game included. The fact that Skylanders Spyro's Adventure, Hasbro Family Game Night Fun Pack, Beyblade: Metal Fusion Battle Fortress, and Kirby's Return to Dream Land are listed makes the list all the less credible. They are by no means "rare games", just sold at or close to its MSRP price. If you consider them expensive, you might as well throw in Skyward Sword or any 49.99 MSRP Wii game. @anonymous - I can appreciate what you are saying about not including recent releases but the games that I did include have kept their high new prices on resale. So the average joe who sells it brand new on ebay or amazon will still get a high price for those games when generally a game's new price will drop pretty quickly. Right now those games are relatively hard to find compared to other brand new games. As I stated in the article though, I wouldn't be surprised if all of those games dropped off the list in the near future as the supply catches up with demand. Apologies, but I couldn't figure out how to login before to comment from my VGPC account, (this is miro69 btw). I appreciate the list you put forth, but from the title, I expected a list of games that were rare & expensive. While most of them do qualify, the four that I mentioned earlier hardly do. I can understand what you're saying that the average person would get more for those games, but I feel as if the titles shouldn't qualify for this particular list. It goes without saying, that the used market and New market are entirely different. In some cases, people are willing to pay 5x more for a new game than a used one. I realize that the majority of the people on this website deal with used games, and that's what this article seems to particularly cater to, but I think it's worth noting that New games should be considered as well. ie. A used copy of Pokemon Battle Revolution for the Wii is probably 20-25$ used, but new copies go for $70-$80. In fact, most Out-of-print wii games (new ones) fetch for quite a lot. The titles I listed have become pretty rare and expensive, even if their used prices say otherwise. Just some food for thought. @anonymous - thanks for your feedback as always. I will take into account what you are saying when I update the article in a few months. More than likely the games you are mentioning will drop off and some other OOP Wii games will take their place. I will try to exclude games that are new releases unless they are actually selling for more than the original MSRP. What about Fatal Frame 4: Mask of the Lunar Eclipse? I know you can find it online, but it's a pretty rare game to find in stores. It was only released in Japan. I know it sells for $99.95 used on eCrater. I imagine it's a lot more brand new. @anonymous - Fire Emblem Radiant Dawn is definitely one of the more expensive Wii Games now. It sells for $38 used and almost $70 brand new. When I wrote the article it wasn't quite as expensive but I will definitely include it in any updates to the article. 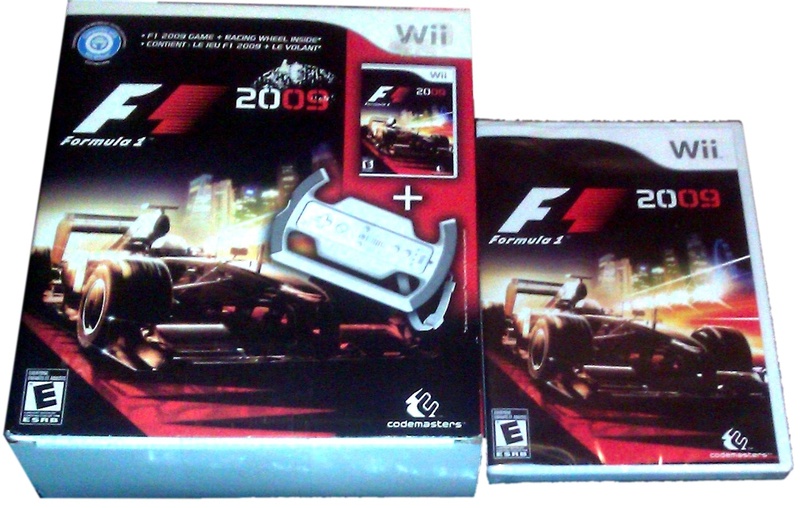 @Spencer - I would love a photo of the F1 2009 Deluxe Box. If you can take it with a solid color background I will edit it a bit so the picture is just the game. You can email it to the address on the "contact us" link in the footer. Hey, its on the site! Thats so awesome! Little surprised that Xenoblade Chronicles wasn't on here for the US. Very hard to find when it was released and doesn't look like a large quantity were made for the US. Love the site. It is a great reference. Most of these games are available in canadaian eb games for very low prices IF you can find them. I picked up dragon ball z today for 15, and resold it for 80 later in the day. Would you mind updating the prices and game lists please? I expert on gamecube and wii games so those 2 lists, when you find the time, really need an update. For example, skylanders is in no way worth that much. I live in Canada and these prices are very different as well, so a canadian list would be a great help. Thanks! i don't think Kirby's RTDL is that rare... but if it DOES get discontinued than I guess I will have a mimimal collectors item on my hands. Nintendo shouldn't discontinue it though, the game is amazing. Sodoku Ball was NEVER released for the Wii. I contacted them through the website, and they confirmed this. what about calling? the cheapest price i found on ebay and amazon (new and both ntsc and pal) was 57 us $ on ebay and 139 us$ on amazon. grea list! my cousin ons beyblade, so i might "borrow" it! @gayjay34 - Yes, Xenoblade Chronicles is quite valuable now. It was only released at Gamestop and apparently in limited quantities. The game sells for $90+ now in used condition and $100+ when brand new. Sudoku Ball Detective has been sold on Ebay for 7.99 a few times, used. It seems it was released on Europe only. A NEW copy is on auction for 39.99. I'm schocked with Xenoblade, that's pretty expensive... 90$ for an used game. And Acent Core X plus or something like that it's quite rare, same goes for Ju On and Calling for wii. I've been trying to find F1 2009 since my son used it as a plate. My husband is tweaked off. Is it really that rare? hi! also, i am happy my first sale was to JJ. anyway, JJ also forgot to leave feedback. oops. my last name says Pund. Benjamin - Thank you for selling that game and reminding me to leave feedback. I did so right now. Welcome to the site. I hope you will stick around and use it in the future. Wii Archives: Resident Evil apparently sells for $100 on eBay, but at Frys I've seen copies for $20 bucks brand new. I'm almost positive I've seen the Metroid game at Frys for $30 as well. Another interestingly cheap but rare Wii game is "Maximum Racing: Crash Car Racer". Only 1 for sale currently on Amazon and 1 on Ebay. The rare Wii game speculation is great now that the system is winding down. I've noticed Oregon Trail, Exerbeat, and NewU Mind Body Yoga & Pilates Workout are quite pricey at the moment. There are 10 of Oregon on ebay right now and 5 of exerbeat but only two of NewU. Interesting how these exercise games ,like Walk it Out become rare. 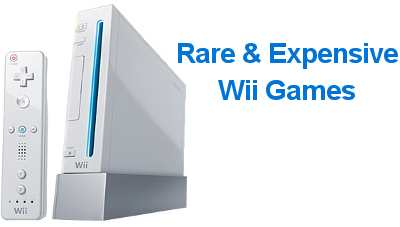 Is it demand from collectors or Wii exercise enthusiasts? @PBR Light - Often rare and unpopular games are the same thing. There are lots of rare games that are quite cheap because nobody wanted them when they first came out and nobody wants them now either. For a game to be valuable it needs to be rare AND popular. If nobody wants to buy it there could be 100 copies in existence and it could sell for $5. The Wii has lots of "rare" titles that were shovel ware, but they will probably never become valuable because nobody wants them. @740buckeyehunter - SUDOKU BALL DETECTIVE was released for the Wii (in Europe at least) - check on ebay - normally goes for around £10-£20. Wow, is this list ever going to be properly updated? Game Stop has Dokapon Kingdom in stock for $24.99 right now on their website, get them while they are hot. What is story with Dokapon Kingdom? How many times has it been reprinted? Are there any differences in the different prints? Dokapon has been reprinted multiple times. The original release featured a disc that was mainly 1 color (blue). The first reprint I know of was a little over a year ago and comes complete with everything but the disc has full color. The second reprint that just occurred appears to be disc only sold through GameStop, though it's too early to confirm if they are all disc only. Not sure what this will do to the prices but if the artwork and manuals weren't reprinted, or were destroyed, it would make it much harder to find complete copies vs the disc only....Luckily I have my complete copy put up. Feel sorry for the collectors who paid $100+ for this just to see it reprinted. Atlus tends to do that frequently and I'm waiting for it to occur with Rule of Rose (Which I also own complete/mint). @anonymous - Thanks for the reprint info on Dokapon Kingdom. The chart on Dokapon shows the results of the reprint at the end of 2012. The price drops substantially. Interesting how it increased again so quickly. I expect the loose prices will drop again after this 2nd reprinting. Rule of Rose will almost definitely be reprinted. Atlus has a long history of doing so. Unless you have a limited edition version of their games, count on it being reprinted if it ever becomes valuable. Watch for American Mensa Academy for the wii. I don't see it for sale very often on ebay and amazon does not have many copies either. @JJ-No problem on the reprint info. I think it's important to share that info so fellow collectors don't overspend on what was a rare game. Gamestop has been working with Publishers and doing a lot of reprints lately. Cave Story, Nier, Dokapon Kingdom, apparently some of the Mega Man DS and Dragon Quest DS games, and of course Metroid Prime Trilogy and Xenoblade. Xenoblade seems like the copies are drying up a little and with the New 3DS getting Xenoblade port I expect Nintendo won't reprint many more in the hopes of pushing the New 3DS. Anyway, it's definitely something to keep an eye on as Gamestop has released statements that they plan to continue working with Publishers and releasing these types of reprints. A list to track them here, or somewhere, would be a huge benefit for all collectors. Has anyone seen "My Personal Swing Coach with David Leadbetter"? It looks expensive on Amazon. It looks like Fire Emblem and possibly some other Wii games have received reprints. Fire Emblem shows a 2014 copyright date on the back. I also believe there are others that we haven't noted in the comments here. An example is "Calling" by Hudson. It mysteriously is more widely available with new copies available under $60. PBR, or anyone else, have details on exactly what titles have been reprinted? As I mentioned above, I think it's important for the collecting community to note what titles have been reprinted. I will watch for Calling. I have been tracking it but no copies have popped up at gamestop near me. I wonder how a reprint would work with Hudson now defuncy. Would there be another outlet for a reprint to be sold other than gamestop? Ju On: The Grudge would be another I put in the "likely to get a reprint"
I'm not sure these latest reprints are related to Gamestop. Fire Emblem with the 2014 date has been popping up on eBay and Amazon. I then noticed some new copies of Calling selling for lower than normal in New condition. I know my original copy of Fire Emblem does not have the 2014 date on the back in the copyright box and I'm wondering where these copies came from and what others are involved. I'm unsure on Hudson games and it may be a coincidence but also something we should keep an eye on. And the console is still new. Imagine the prices after 10 years. Yea, it's almost assuredly a reprint. Just a month or so ago there weren't many new copies available and now suddenly, there are many listings popping up on ebay and Amazon for around $40. With all these hard to find Wii games routinely being reprinted collectors definitely need to stay on their toes.